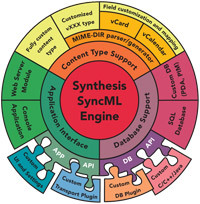 SyncML is a platform and transmission media independent protocol for data synchronization. We think that intelligent data synchronization is an important concept for present and future (mobile) computing (see also Technology section). Thanks to the SyncML standard, non-proprietary data synchronization is possible today.